…I met my partner, my best friend and my favorite person ever. Little did I know that we would end up spending almost every moment together, that he would show up to *every* one of my races, and that he would consider living abroad and get us there in a *snap* after a mere suggestion. On our first date we went to see the largest urban colony of bats. Isn’t that romantic? Okay, not super romantic but hella interesting and fun. We followed the bat watching with a bit of local ice cream. I mean, why not? We headed to Amy’s Ice Creams, where I ordered some dark chocolate ice cream with Twix and Oreo mixed in (sinful) and G ordered sweet cream with fresh strawberries mixed in (I think!). It was at Amy’s where the magic happened. It was while we sat outside in the hot sticky August heat that I realized G was a nice guy, easy to talk to. The beginning of a wonderful thing. 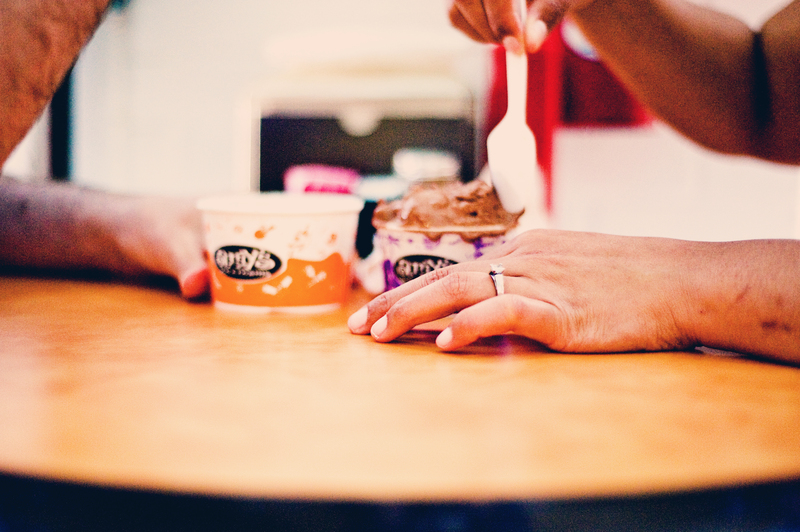 Here’s to many more years together…eating ice cream here and there. 27 Aug	This entry was published on 27/08/2011 at 8:00 AM. It’s filed under Austin, love and tagged Amy's Ice Creams, Austin, Love, Nessa K Photography, Relationships. Bookmark the permalink. Follow any comments here with the RSS feed for this post. Congrats! Love the e-pics too. Congrats and your engagement photos are so cute! Congrats on 5 years! Great pics!! Happy dating anniversary! It is our 13th today so we share a dating anniversary weekend!